The 1948 Silverstone Grand Prix will be celebrated at this year’s Silverstone Classic, to be staged 20-22 July 2018 at the historic 3.6-mile Silverstone Grand Prix circuit in Northamptonshire, England. Not only does the Silverstone Classic’s programme of 21 races feature more than 80 Grand Prix cars from yesteryear but the event will also include a special collection of cars that contested the inaugural Royal Automobile Club International Grand Prix in 1948. Often referred to as ‘The Race on the Runways’, it was a historic meeting which marked Silverstone’s opening as a motor sport venue. That first official race was staged on little more than a makeshift circuit using the wide runways and portions of narrow perimeter roads of what was at the time a disused wartime airfield. The improvised track itself was demarcated with 170 tons of straw bales plus 250 oil drums and, curiously, saw the drivers racing flat-out towards each other from opposite ends of the same long runway. 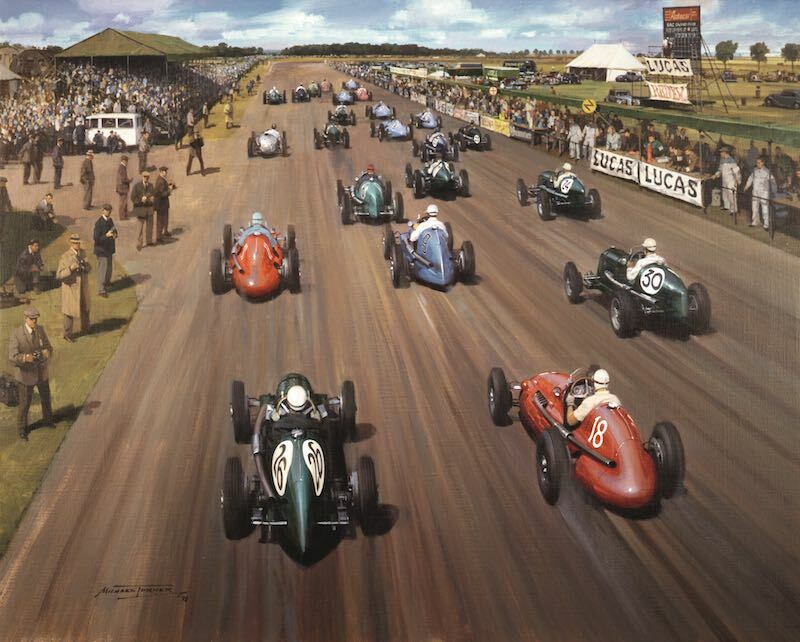 Despite hasty preparations, a full 25-car field was assembled on the start/finish line (then located before Woodcote Corner) for Britain’s first major post-war international race — a 65-lap encounter dominated by the two factory-entered Maserati 4CLTs of Luigi Villoresi and Alberto Ascari. Despite starting from the back of the grid after getting delayed on their way to the circuit and thus missing qualifying, the two Italian aces quickly fought their way to the fore and wowed a 100,000+ crowd eager for some much-needed entertainment in a country saddled with post-war austerity. Two years later, Silverstone hosted the very first FIA World Championship Formula One race on a much-changed layout and, since then, has held a further 50 British Grands Prix with a roster of winners including all the sport’s greatest names. Juan-Manuel Fangio, Jim Clark, Jackie Stewart, James Hunt, Nigel Mansell, Ayrton Senna, Michael Schumacher and — most recently with four consecutive triumphs — Lewis Hamilton have all won the prized British Grand Prix at Silverstone. What’s more, many of the great cars that have raced at the Northamptonshire venue over the years are still reliving their glory days at the Silverstone Classic. The weekend’s pair of races for the Adrian Flux Trophy for Pre-1966 Grand Prix Cars administered by the Historic Grand Prix Cars Association (HGPCA) feature a mix of GP cars from the sport’s formative years. The 50+ car grid is packed with a large number of front-engined F1 cars from the fifties as well as a posse of rear-engined racers from the first half of the sixties. Regarded by many as the highlight races on the 2018 Silverstone Classic bill, the pair of FIA Masters Historic Formula One Championship showdowns recreate what is widely hailed as F1’s golden age: the DFV era from 1966 to 1985. Cars still compete in their period liveries and deliver the same spectacle and sounds as they did back in their halcyon heydays. Adding to the 70th anniversary celebrations, a collection of cars from the original race — including ERA, Talbot Lago and Maserati racers driven by the likes of Lord Selsden, Raymond Mays and Peter Walker in 1948 — will also be on pole position outside the lower entrance to the International Paddock throughout the three-day festival. They will be fired up to perform a special track parade on Saturday afternoon. “Seventy years of Grand Prix racing at Silverstone is an incredible landmark that presents us with a wonderful opportunity to recount the extraordinary story behind that first historic race in 1948 – it was one of the most important days in British motor sport,” hailed Event Director, Nick Wigley. For further details, visit SilverstoneClassic.com.